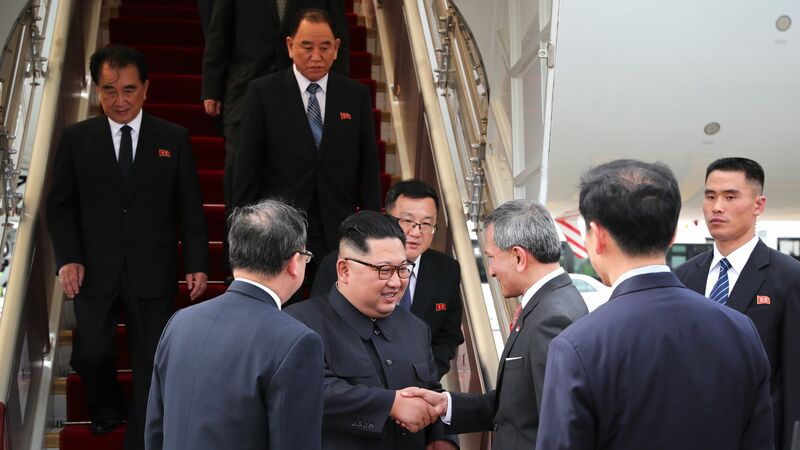 North Korea's state-run Korean Central News Agency reported on Monday morning in Pyongyang that leader Kim Jong-un is in Singapore for Tuesday’s historic summit with President Trump — breaking its silence to citizens who have long been kept in the dark about the timing of the momentous occasion, the AP reports. The details: A report by the outlet, the AP notes, said both leaders will exchange “wide-ranging and profound views” on establishing a new relationship, building a “permanent and durable peace mechanism” and the denuclearization of the Korean Peninsula. The backdrop: Until today, the nation's official state-run media had previously only reported that both leaders would meet, but it hadn’t informed citizens about the time and place of the meeting — let alone that Kim had arrived in Singapore earlier today. Previously, the current top story in North Korea centered on Kim's visit to a seafood restaurant in Pyongyang.